An estimated 400,000 people marched through the streets of New York on Sunday, demanding urgent action on Climate Change. The march was the first in a series of events this week to highlight the issue of global warming ahead of the UN Climate Summit on Tuesday. The massive event saw a number of high profile attendees, including UN Secretary General Ban Ki-moon, New York city mayor Bill de Blasio, former US vice-president Al Gore, the newly appointed UN Messenger of Peace, Leonardo DiCaprio, environmentalists and many others. The march was kicked off at 11:30 am along Central Park and followed a two-mile route through the city. The passionate plea of the crowds could be seen in their numbers, their vociferous demonstrations and the colourful costumes – there was a huge model of the earth, an enormous inflatable cow to highlight the ecological footprint of the meat industry, people dressed in Lorax costumes and as doctors to protest the health effects of climate change. Showing solidarity with the events unfolding in New York were various other demonstrations across the globe. Actress Emma Thompson and musician Peter Gabriel joined a group of 40,000 protestors in London. 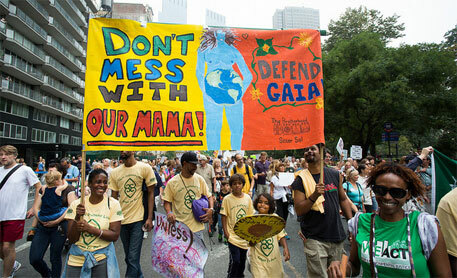 Around 5,000 people gathered together in the French capital with banners such as “Climate in Danger” and “World leaders, act!”. Over 1,500 people took part in a march from Mandi House to Jantar Mantar in New Delhi, India, urging for stronger action on climate change. In all, over 2,000 events are said to have taken place in 150 countries ahead of the Summit that will bring together world leaders from 125 countries. “Today, civil society acted at a scale that outdid even our own wildest expectations, tomorrow, we expect our political leaders to do the same”, said May Boeve from 350.org, one of the non-governmental organisations participating in the march. Reports observed that they are paid artists.